Looking at current trends in educational research provides an eye-opening view of the modern classroom. If you’re looking into a career in education, keeping up with changing instructional styles prepares you to enter the field with the tools you need to best serve today’s students. 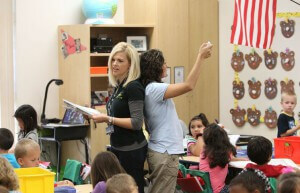 Putting two instructors in one classroom is known as team teaching, collaborative team teaching or co-teaching. This model provides benefits and presents challenges to both teachers and students. Kids in co-teaching classrooms observe teamwork in action and learn to see concepts from more than one perspective. They have the chance to learn from teachers with diverse backgrounds and can delve deeper into subjects thanks to the opportunity for more one-on-one instruction time. However, conflicting personalities and the tendency of students to favor one teach over the other can threaten the stability of this model. A great deal of research is being done on how diversification of instruction to cater to the unique needs of students may help them to better grasp core subjects. This type of instruction moves away from the traditional lecture model of teaching and offers students a way to learn at their own pace. Slower learners can take the time they need to develop a solid understanding of material while more advanced students don’t have to wait to move on to the next concept. This better addresses individual learning styles and allows teachers to utilize diverse platforms to provide instruction. The potential benefits of putting kids of different ages together in the same classroom are still being researched, but many schools have been using this teaching method for years with good results. In a mixed-age classroom, young students learn how to interact with older ones and benefit from observing their academic abilities. Collaboration between age groups facilitates further development. Achieving advanced competencies at a young age increases confidence. Teachers also benefit from mixed-age classrooms in that they’re able to track their students through more than one grade to get a clearer picture of academic growth. Based on neuroscience research that shows consistent practice of a concept creates strong pathways between neurons, brain-based teaching takes advantage of the power of the developing mind to create the greatest amount of positive changes during the short period that kids are in school. Kids work in groups, participate in games that address specific concepts and engage in lessons built around central themes, all with the goal of improving their understanding of important academic skills and ideas. Physical education is included to facilitate the growth and development of new neuronal pathways. Although memorization of fundamental facts is critical to building a foundation of knowledge in the early grades, kids also need to be taught how to apply those facts in a multitude of situations. Research into critical thinking skills is driving new ways of teaching that include encouraging students to ask questions, develop problem-solving skills by working in groups and discuss the outcomes of their experiments. These methods of discovery give kids a more active role in their education and teach them how to make decisions by applying the facts they’ve learned to the problem at hand. Keep an eye on these and other research trends as you study to become an educator so that you know what’s expected of you when you’re in charge of a classroom. Make what you learn an integral part of your teaching methods, discover what works best for your students and continue to modify your methods to create the best possible learning environment.